I’ve realized that I’ve totally dropped the ball on my bread-baking this year. Aside from trying new recipes, I’d really like to start baking bread once a week for sandwiches. I decided to get back into my bread groove with this fabulous babka. I made babka once before around the holidays – the traditional chocolate babka, which is just as amazing as you might imagine it to be. 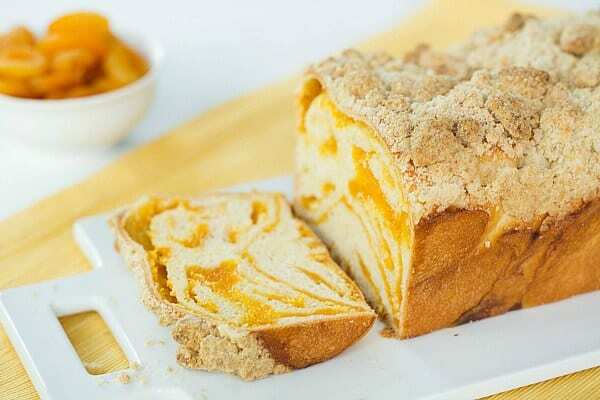 Before a few months ago, I hadn’t seen many other versions of babka until this apricot and cream cheese variation popped onto my computer screen. I was immediately smitten with the pictures and saved it to bake sooner rather than later. The bread turned out just as fabulous as I hoped it would, perhaps even better. While on the surface, this may look like a complicated recipe, it’s actually much simpler than it appears. A simple sweet dough is mixed together and allowed to raise, while the fillings and crumb topping are made. 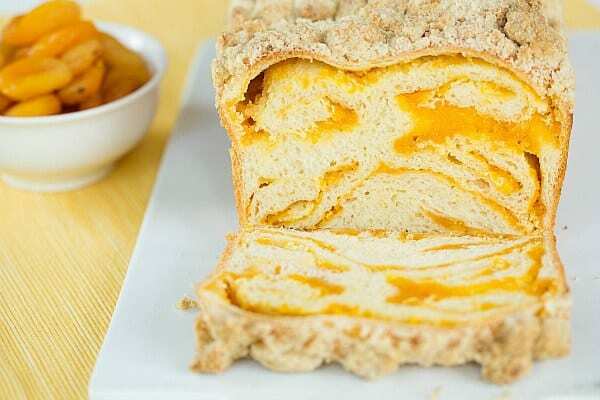 When it comes time to shape the bread, the dough is rolled out into a massive rectangle, spread with the apricot filling, then the cream cheese filling, and is rolled and shaped in such a way so that the amount of filling is maximized in every bite. Then, throw on a crumb topping. Who can resist a crumb topping? Not I. 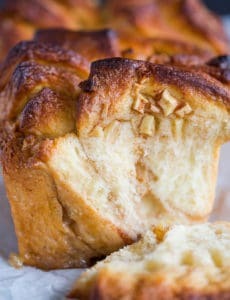 This bread tastes like the most amazing fruit and cream cheese Danish you’ll ever eat. 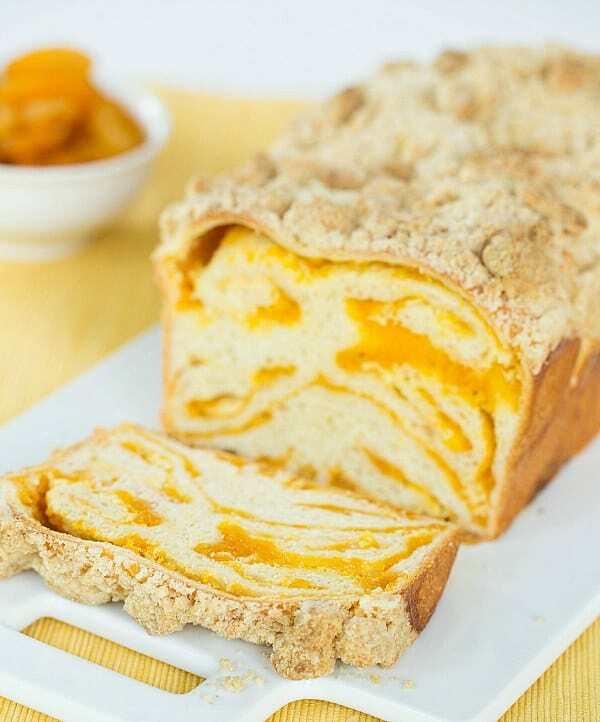 The bread is soft and sweet and the apricot-cream cheese filling is packed into every single slice. A crunchy topping provides the perfect contrast in both taste and texture. This babka makes morning coffee with a friend (or just your favorite book or newspaper) a little extra-special. I think it’s perfectly acceptable for breakfast, a snack or dessert. Babka was a perfect way to jump back into my bread-baking ways. If you’re new to bread or are just looking to try something new, I can’t say enough fantastic things about this bread. Be sure to put it on your to-bake list! 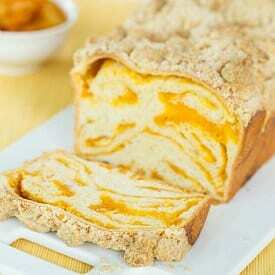 A sweet yeast bread with swirls of apricot and cream cheese, topped with a crunchy streusel. 1. Make the Dough: Place the flour, sugar, yeast and salt in the bowl of an electric mixer fitted with a dough hook. Stir on medium-low speed for a minute or so to combine. Add the egg, milk, vanilla and butter and mix on medium speed until a smooth dough forms, about 5 minutes. Form into a ball and place in a lightly oiled bowl. Cover with plastic wrap and place in a draft-free area until doubled in volume (about 1 hour). While the dough rests, make the fillings and streusel. 2. Make the Apricot Filling: Combine the dried apricots, orange juice, lemon juice and sugar in a small saucepan and bring to a simmer over medium-low heat. Simmer uncovered for 10 to 15 minutes, stirring occasionally, until the apricots soften and the liquid is reduced by half. Remove from the heat and allow to cool completely. Once cool, transfer the mixture to a food processor and process until a puree forms. Set aside at room temperature. 3. 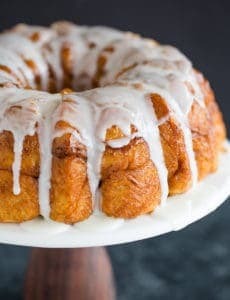 Make the Cream Cheese Filling: In a medium bowl, stir the cream cheese and sugar with a wooden spoon until smooth and lump-free. Add the egg yolk, vanilla extract and salt, and stir to combine. Set aside at room temperature. 4. Make the Streusel: In a medium bowl, whisk together the flour, sugars and salt. Add the butter and mix with a rubber spatula until the mixture comes together into large, coarse crumbs. Cover and refrigerate until ready to use. 5. Assemble the Babka: Lightly grease a 9x5-inch loaf pan; set aside. 6. On a lightly floured surface, roll the dough out into a 10x24-inch rectangle, with the long edge facing you. Spread the apricot filling evenly over the dough, leaving a ½-inch border along all of the edges. Spread the cream cheese filling over the apricot filling. 7. Starting with the bottom edge, roll the dough into the middle of the rectangle, then do the same with the top edge so that the two rolls meet in the center. Visualize the long cylinder divided into three equal lengths. Fold the left third over onto the middle third. Then, fold the right third over the middle third. Pick up the dough and turn it over so the seam is on the bottom. Then, holding each end, gently twist it in the middle and place it in the prepared pan. 8. Whisk together the egg and salt for the egg wash and brush it over the babka. Lightly cover the pan with plastic wrap and place it in a draft-free area until it is doubled in size, 1½ to 2 hours. 9. 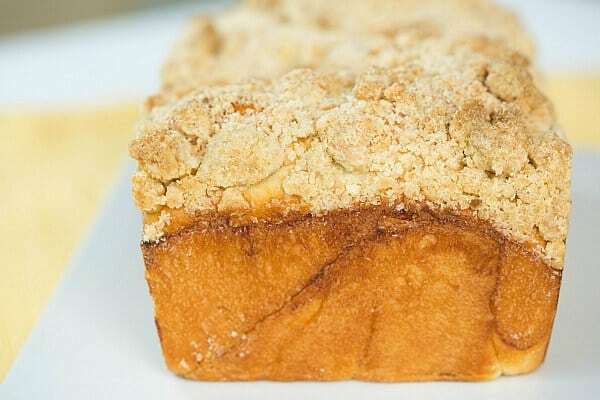 Preheat oven to 375 degrees F. Brush the babka once again with the egg wash and sprinkle the streusel evenly over the top, pressing lightly so the crumbs adhere to the babka. Bake until the top is a deep golden brown, about 50 minutes. Cool the bread in the pan set on a wire rack for 25 minutes, then unmold the bread from the pan (some of the streusel may fall off) and place on the wire rack to cool completely. The bread will keep, wrapped tightly in plastic wrap, for up to 3 days. Dear Michelle: I have made your recipe twice, sort of. I used my bread machine the first time, and mine will do the shimmy-shimmy shake if the dough doesn’t have enough liquid in it. I added some water and made the mistake of not looking again, because it was quiet, and I assumed it was OK. Not-the paddle was out in the pan so I had to finish that dough manually. It turned out very nicely, but the streusel fell like rain when I tried to take it out of the pan. I didn’t use parchment paper-I do now. The second time, my third babka, after doing the Cinnamon one from Cook’s Country-same as the one on your site, was the Apricot Cream Cheese as a Prune Cream Cheese. It turned out really well. I combined a lot of different elements. I put an extra 1/6th of a cup of water in the dough, and the machine handled it beautifully. When I assembled it, I used the Cinnamon Babka rolling method from Cook’s, did the egg wash, used the parchment, AND-your streusel will stay on very well if you add a bit of egg white to it. The ratio is 1 large egg white per 2 cups of streusel, so you have to cut it down for a smaller amount of streusel. It makes the streusel a bit firmer and crisper, but not so that you can’t slice it. I don’t have a stand mixer with a paddle, so for the Cinnamon Babka, I used a hand-held with the bread dough hooks. I didn’t think in time to haul out the very heavy and very old Sunbeam stand mixer I inherited. If I do the cinnamon version again, I will try to remember. It was 5-star, too, btw, but more of a babka for “state occasions” as it’s VERY leaded. 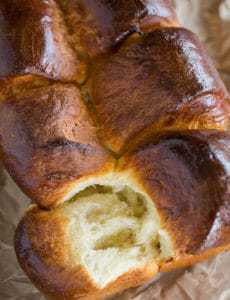 Your babka recipe is a lot lighter and still very good.Thank you for posting this recipe. I had taken photos of the long babka recipe and it’s various fillings in Allrecipes magazine at my chiropractors’ office. I have to view them in zoom mode so I can read them and transcribe them-don’t ask-and there were several fractions in fillings that I couldn’t read, and that led me to your recipe. I now have the correct fractions for their fillings, and that is a very nice article. I have not tried their recipe yet as it makes 3 and I don’t need that many at one time, although the slices do freeze beautifully, but I don’t have the freezer space right now, either. That recipe with its walnut filling, which I can’t have, is now online at Allrecipes, but the other fillings in the article are not. Hi Kathy, I’m so glad you enjoyed it, thanks so much for leaving a review! I love this reciepe. Can you freeze these types of bread? Hi Lauren, Yes, you can definitely freeze!